This edition of Passing Pioneers includes two months of obituaries, September and October. The photos I have posted at the Western District Families Facebook page have become a useful tool for finding obituaries. Recent photos of Western District hotels have helped me find a number of obituaries of publicans past and there are four this edition. During Family History Month in August, I posted a photo of the Kent family of Casterton on the Facebook page and below you’ll find the obituary of one of the family members. There is “feature” obituary for each month, with both subjects making significant contributions to their associated towns. As usual, if you click on any underlined text, you’ll go to further information about the subject. BEGG, Thomas – Died 3 September 1895 at Branxholme. Thomas Begg was born at Cumberland, Scotland around 1819. He married Mary Reid in 1842 and they had three children. In February 1855, the family left Liverpool onboard the Nashwauk bond for Adelaide, South Australia. With them were around 300 other immigrants and 130 Irish Orphan girls. On day eighty-nine of the voyage, they reached Gulf St Vincent near Adelaide. As the ship headed toward the mouth of the Onkaparinga River south of Adelaide, it hit the shoreline. Fortunately, the passengers were rescued and taken to nearby Noarlunga. Everything the Beggs owned was lost but at least they survived. They travelled by land to Adelaide, where Thomas bid farewell to his family and left for the Bendigo diggings. After fifteen months in Victoria with no luck, Thomas returned to Adelaide and took a job at a flour mill. He was suffering from poor health and after doctor’s advice to move to the country they headed for the south-east of South Australia. The family remained there until around 1865 when Thomas selected land at Condah. He named his property Foutus. Thomas was a councillor for the Portland Shire from 1875 and Shire President from 1877 until his resignation in 1880. He and Mary remained at Condah until the early 1890s when they moved to Branxholme. In June 1892, Thomas and Mary celebrated their fiftieth wedding anniversary at the Branxholme Mechanics Institute with 150 guests in attendance. William died in 1895 after a long illness and buried at the Branxholme Cemetery. The funeral cortege on 6 September was one of the longest seen in the district and the coffin was almost totally covered with wreaths. Mary died in 1912 at the age of ninety-two. 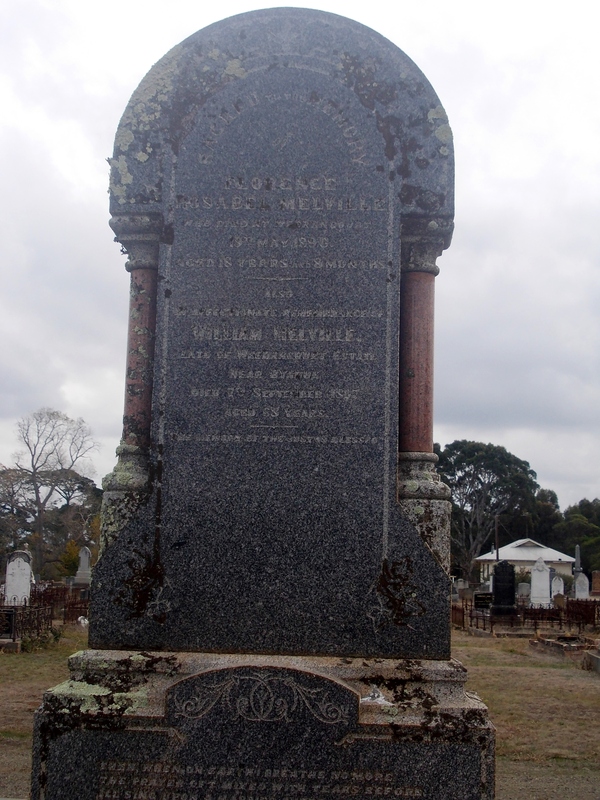 MELVILLE, William – Died 7 September 1897 at Byaduk. William Melville was born in Sutherland, Scotland around 1829. He arrived in Victoria in 1852 and went into partnership with William Bayles forming Bayles and Melville in Melbourne. In 1858, William married Ann McDonald. The following year Ann gave birth to a son, William Henry but she died as a result of the birth, aged twenty-four. “Advertising” The Age (Melbourne, Vic. : 1854 – 1954) 27 August 1859: 4. Web. 5 Sep 2018 <http://nla.gov.au/nla.news-article154826326&gt;. Meanwhile, business was good for Bayles and Melville and they expanded their interests into grazing land taking up Weerangourt south of Byaduk. On 18 April 1867, William remarried to Annette Margaret Bayles, a daughter of William Bayles and they settled at Weerangourt. The partnership of Bayles and Melville was eventually dissolved but William continued on at Weerangourt. In 1893, a new homestead was built. William was also a Justice of the Peace. At the time of his death, William left his widow Annette and five sons and two daughters. He was buried at the Hamilton (Old) Cemetery. JACOBY, Sigismund – Died 15 September 1917 at St Kilda. “OUR ST. KILDA LEGISLATORS.” The Prahran Telegraph (Vic. : 1889 – 1930) 7 September 1889: 3. Web. 9 Sep 2018. Sigismund Jacoby was born in Toruá, Prussia (now Poland) in 1837, the eldest of Salomon and Rosalie Jacoby’s seven children. Salomon was a soft goods merchant in Toruá. 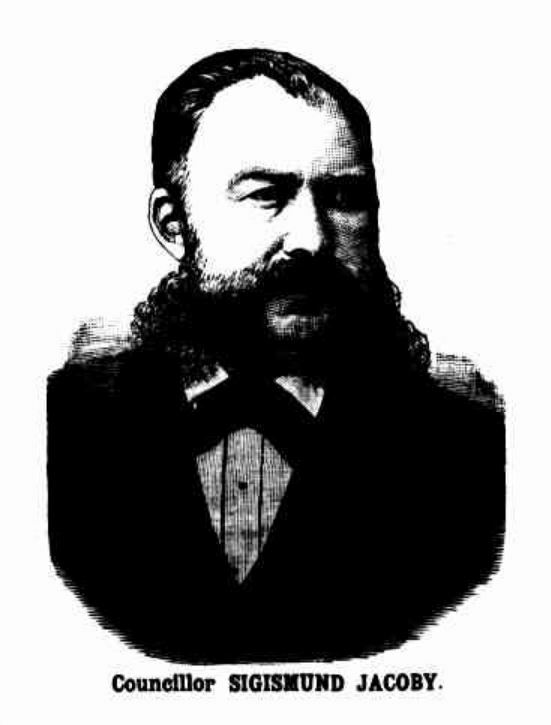 Sigismund arrived in Australia around 1860 but left soon after for New Zealand where he worked in the retail trade. 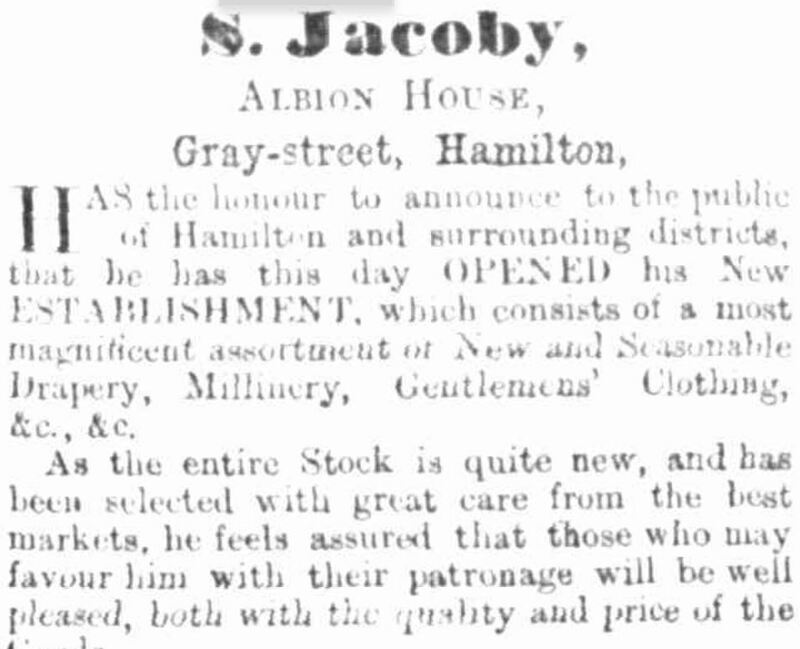 He returned to Australia in January 1866 and by the end of April 1866 had opened a store “Albion House” in Gray Street next to the Bank of Victoria. “Advertising” Hamilton Spectator and Grange District Advertiser (South Melbourne, Vic. : 1860 – 1870) 28 April 1866: 3. Web. 14 Oct 2018 <http://nla.gov.au/nla.news-article194470438&gt;. By June 1866, Sigismund was on a committee investigating the viability of Hamilton having a fire brigade. He was able to offer knowledge gained while in New Zealand. By mid-March 1867, he was sitting on the Hamilton Borough Council. Also in 1867, Sigismund went into partnership with Isidore Rehfisch. The partnership was dissolved in 1868 and Sigismund once again traded alone. In 1869, he partnered with Henry Horwitz of Horwitz & Co, a rival draper in the town. Sigismund moved to the corner of Gray and Thompson Streets and “Albion House” was let. “Advertising” Hamilton Spectator (Vic. : 1870 – 1918) 13 April 1870: 1. Web. 11 Sep 2018 <http://nla.gov.au/nla.news-article196302868&gt;. 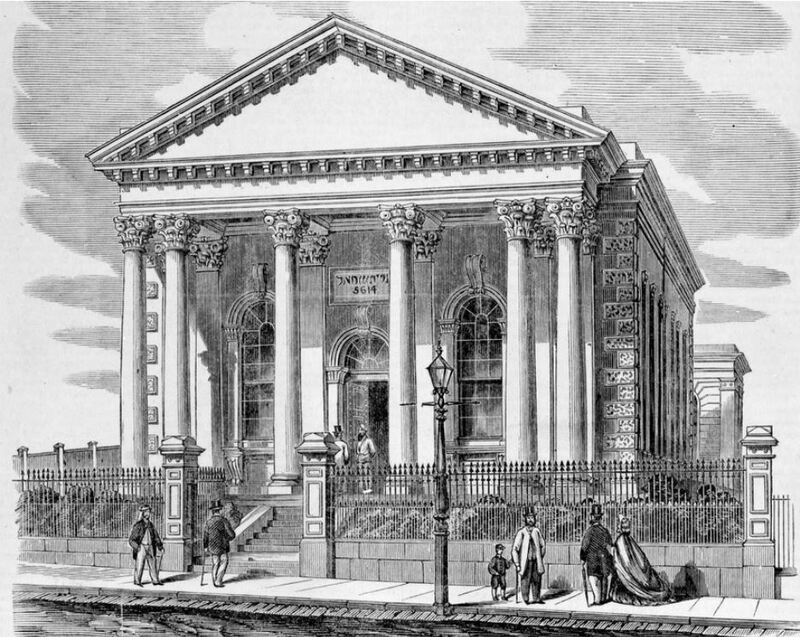 On 4 August 1869 at the synagogue in Bourke Street West, Melbourne (below), Sigismund married Hannah Horwitz, a talented pianist and a daughter of Henry Horwitz. They had four children, three boys and one girl, all born in Hamilton from 1870 to 1876. On 16 August 1875, Sigismund was elected as Mayor of the Borough of Hamilton. An inaugural Mayoral dinner was held at the Victoria Hotel on the same day Sigismund was appointed as a Chief Magistrate. He held the Mayoral role until the following August when Councillor Stapylton Bree became Mayor. Sigismund remained on the council and also sat on the Hamilton Hospital committee and was a founder and director of the Hamilton Gas Company. He believed as a resident, it was his duty to help improve the town. After the first Hamilton Post Office was demolished in 1876, Sigismund purchased the bluestone to build St Ronans off Pope Street, Hamilton. The home was of a similar design to the former post office. By 1878, Sigismund’s youngest sibling Max had arrived in Hamilton and it was in that year both were naturalised. The following year, Sigismund travelled to Europe with Hannah as a British subject. To farewell him, a banquet was held on 3 April 1879, held in the Hamilton Town Hall. Max took over the running of the store while he was away. “ITEMS OF NEWS.” Hamilton Spectator (Vic. : 1870 – 1918) 5 August 1880: 2. Web. 15 Oct 2018 <http://nla.gov.au/nla.news-article225488522&gt;. 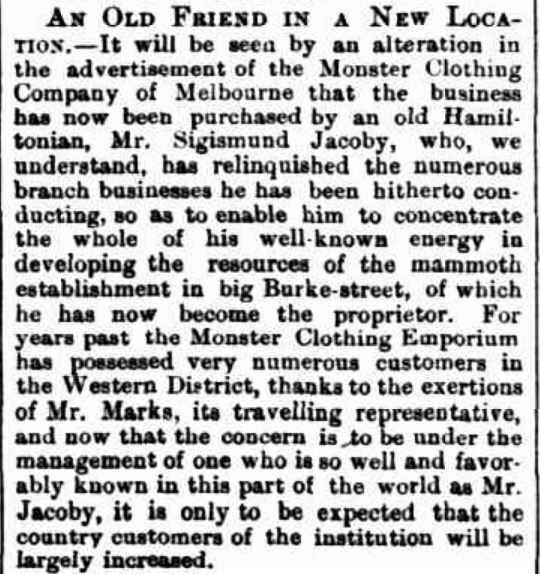 In June 1881, Sigismund purchased The Wholesale Clothing Company consisting of five stores and factory in the Melbourne CBD, Fitzroy, Emerald Hill, West Melbourne, Prahran, and Carlton, the location of the head office. 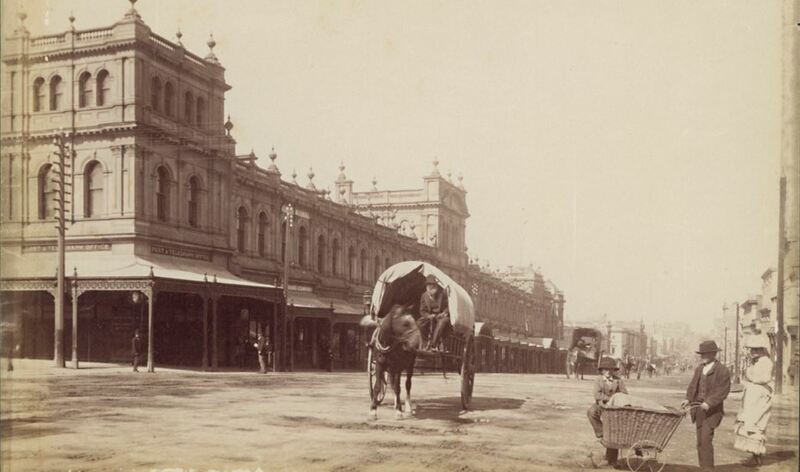 The Bourke Street store was part of the Eastern Market (below). 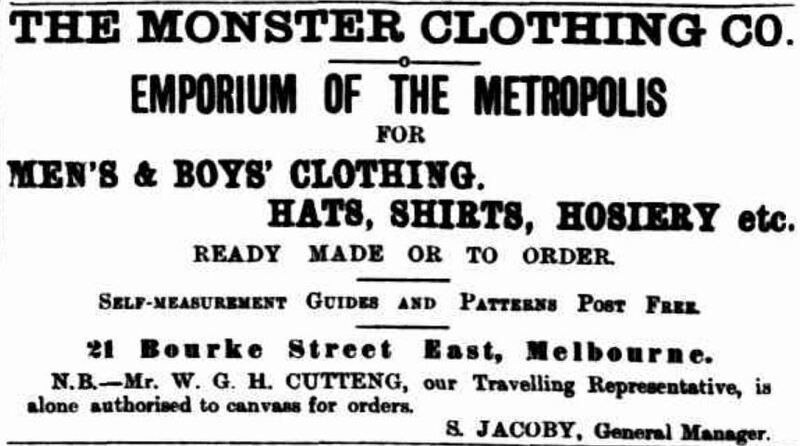 In 1884, moved on from the Wholesale Clothing Company when he purchased the Monster Clothing Company at 21 Bourke Street, Melbourne. The Hamilton Spectator shared the news. “Items of News.” Hamilton Spectator (Vic. : 1870 – 1918) 24 June 1884: 2. Web. 15 Oct 2018 <http://nla.gov.au/nla.news-article226048664&gt;. “Advertising” Hamilton Spectator (Vic. : 1870 – 1918) 6 March 1886: 6. Web. 17 Oct 2018 <http://nla.gov.au/nla.news-article225773930&gt;. Although he had left the town, Sigismund still took an interest in Hamilton affairs. In 1883, he joined a deputation from the Dundas Railway League who met with the Minister of Railways to present a case for a railway line between Hamilton and Ararat. 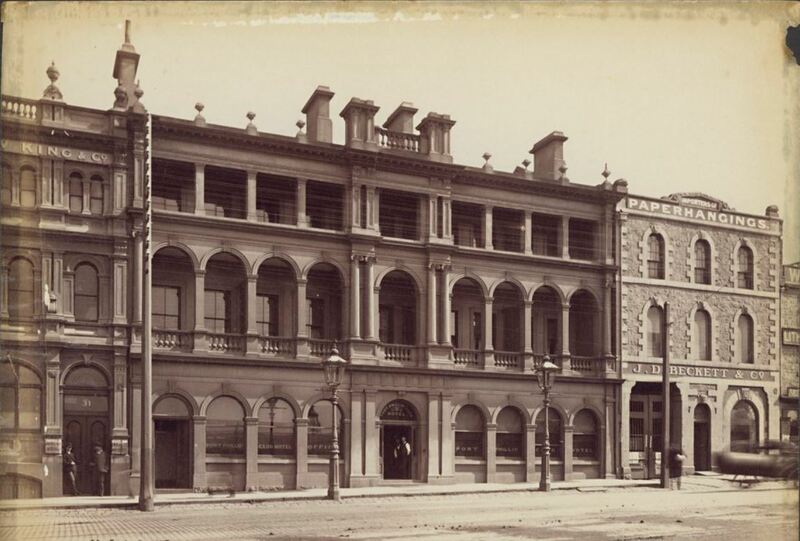 In 1888, Sigismund left the rag trade and became a hotelier, taking over the Esplanade Hotel at St Kilda which he operated until 1897. 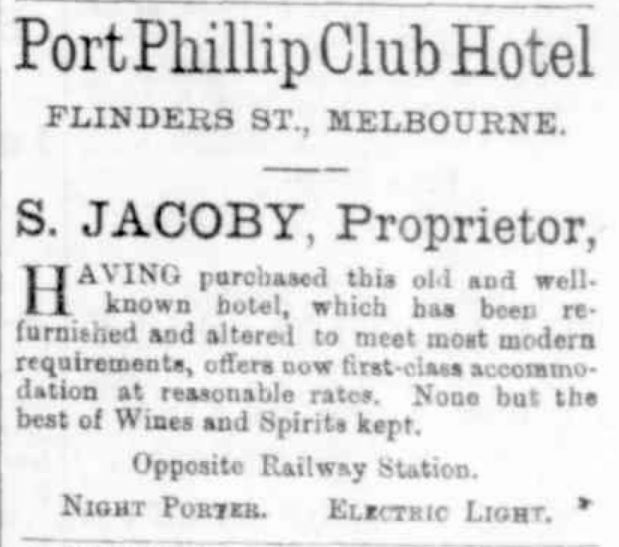 In 1897, Sigismund purchased the Port Phillip Club Hotel at 232 Flinders Street, Melbourne across the road from the Flinders Street Railway Station and a few doors away from Young and Jacksons Hotel. “Advertising” Hamilton Spectator (Vic. : 1870 – 1918) 16 November 1897: 1. Web. 20 Oct 2018 <http://nla.gov.au/nla.news-article226100390&gt;. Sigismund was a member of the St Kilda council from 1888 until 1914, serving as Mayor four times during that period. The Jacoby Reserve in Cowderoy Street, St Kilda West is named after Sigismund. He was also one of the original members of the Melbourne Board of Works and he sat on the committee of the Alfred Hospital. At the time of his death, Sigismund left his widow. Hannah and three sons. Hannah died in 1935. Sigismund and Hannah are buried together in the St Kilda Cemetery. KENT, Michael – Died 21 September 1918 at Casterton. Michael Joseph Kent was born in Thomastown, Kilkenny, Ireland and arrived in Victoria with his parents and siblings as a child. The family lived at Portland and that is where Michael reunited with Norah Nell O’Brien, a girl he went to school with back in Kilkenny. They married and moved to Casterton. Michael did labouring work with the Glenelg Shire, either employed directly by the shire or with shire employed contractors. The Kents lived at Tara (below) and had seven children. Two children died as babies. During winter 1918, Michael Kent was working as a “day man” for the shire. His work as a labourer meant he was out in the wet weather and as a result, he contracted pneumonia and died ten days later. He was sixty-three. Nora died in 1941 aged eighty-eight. McKELLAR, Rachel – Died 2 September 1926 at Malvern. Rachel was born at Kilmichael, Scotland around 1836. She travelled to Australia with her parents John McKellar and Rachel Harkness and siblings when she was fourteen. They settled at Knebsworth near Condah where Rachel’s brothers had already settled. On 3 July 1866, Rachel married Thomas Skene of Warrambeech near Hamilton. Three years later, Thomas purchased Krongurt in South Australia and they moved there. Thomas died in 1884 and Rachel remained at Krongurt until 1902 when she went to live with her daughter in Melbourne. She left three sons and five daughters and nine grandchildren. CAVE, Elizabeth – Died 26 September 1944 at Cobden. Elizabeth Cave was born in the Chatsworth district around 1860. Known as Lizzie, she met Harry Quiney of Mortlake and they married at Harry’s parent’s home at Mortlake on 10 April 1884. Harry held the licence of Mac’s Hotel in Mortlake and in 1885, Lizzie gave birth to her first child at the hotel. In 1909, the Quiney’s built a new hotel on the same site (below). During the war years, Elizabeth was a member of the Mortlake branch of the Red Cross and acted as secretary. Harry Quiney died in 1920 and Elizabeth continued to run Mac’s Hotel until 1927 when she sold. 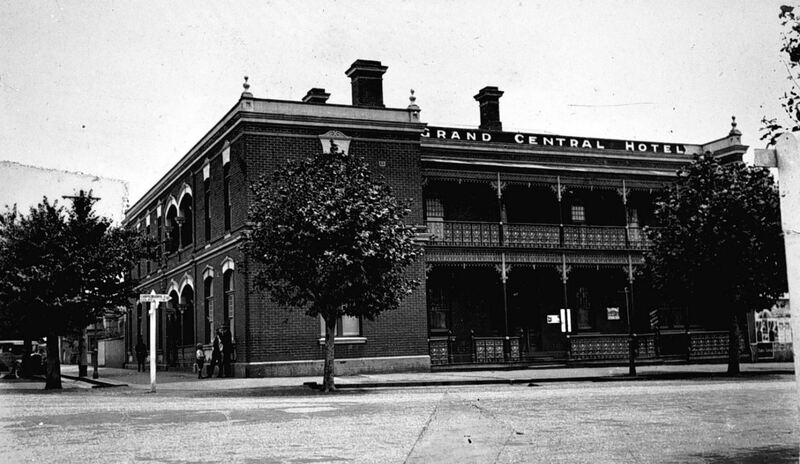 She then moved to Cobden to run the Grand Central Hotel (below). In 1931, Elizabeth left Cobden for a holiday in Tasmania intending to take up another business on her return. Elizabeth spent some time away from Cobden but was settled back there by the mid-1930s. HAFERKORN, Charles Ehryott– Died 10 October 1884 at Hamilton. Charles Haferkorn arrived in Victoria around 1850. He spent time in Melbourne before establishing a brewery and aerated water factory in Gray Street, Hamilton in 1858. In 1860, Charles married Frances “Fanny” Featherby of Croxton East. In 1873, Charles and family went to Balmoral when Charles took up the licence of the Western Hotel but the following year he suffered spinal injuries in a coach accident resulting in paralysis. He continued with the hotel with the help of Fanny. After six years, the Haferkorns moved on to the Coleraine Hotel. 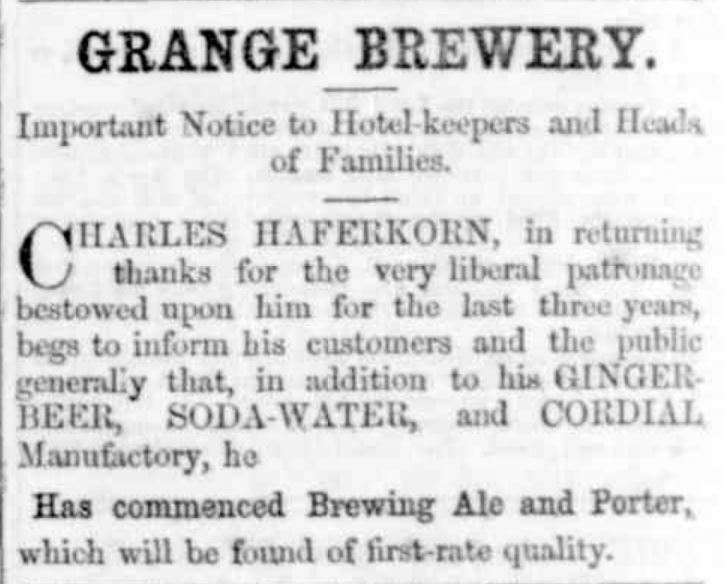 In 1883, they returned to Hamilton and Charles had the Grange Family Hotel built on the site of his former brewery in Gray Street, Hamilton. Charles died at the hotel in 1884. 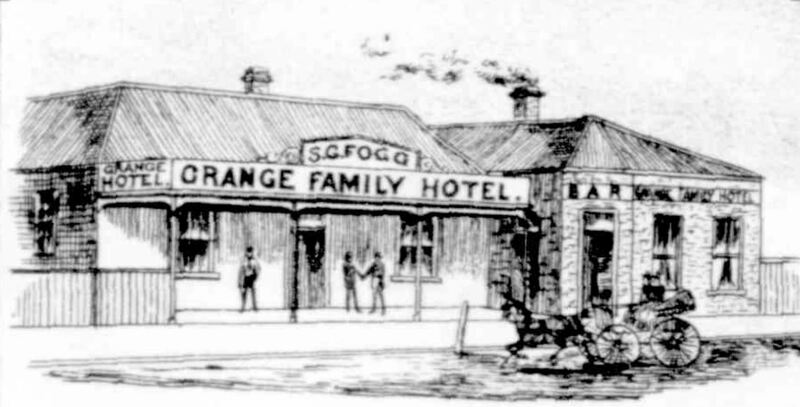 Fanny married Samuel Fogg in 1886 and they continued to run the Grange Family Hotel (below). The Grange Family Hotel in time became the George Hotel. GRANGE FAMILY HOTEL, GRAY STREET, HAMILTON. Hamilton Spectator (Vic. : 1870 – 1918) 17 April 1888: 1 (SUPPLEMENT TO THE HAMILTON SPECTATOR). MARKS, Mark – Died 12 October 1892 at Colac West. Mark Marks was born around 1833. He settled in Colac and in 1857 he married Sarah Ann Owen and they went on to have eleven children over the next twenty-three years. 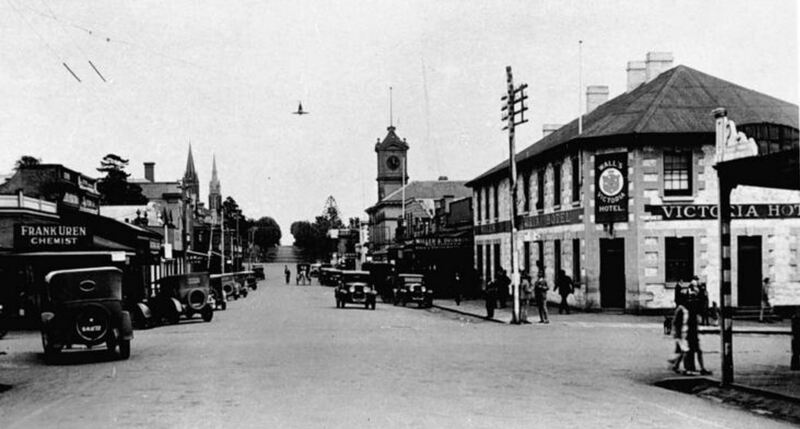 Mark operated three hotels in Colac, the Perseverance and Oddfellows Hotels during the 1870s and the Union Club Hotel from 1880 until the mid-1880s. 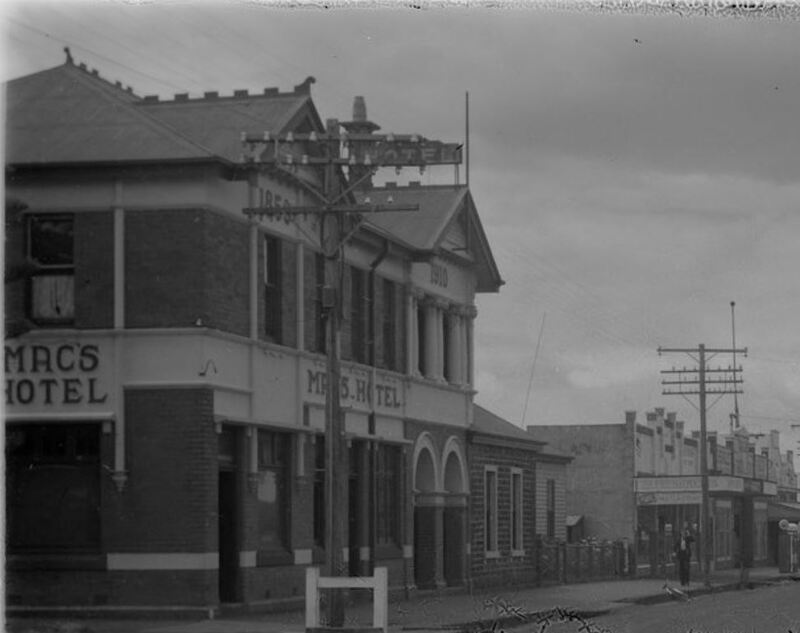 In 1886, Mark took over the Terang Hotel. 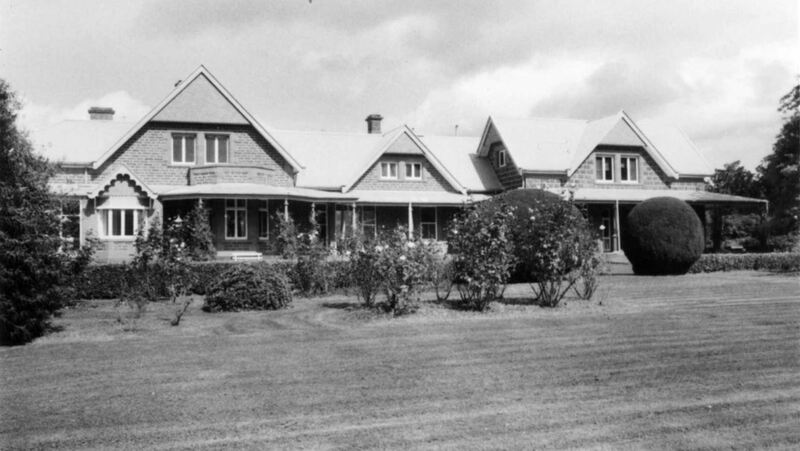 Mark and Sarah returned to Colac in 1891 taking up residence at Laurel Banks estate, Colac West. Mark was a Colac Shire councillor, a supporter of St Johns Church, Colac and one of the oldest members of the Loyal Colac Lodge. Mark was fifty-nine at the time of his death. Sarah died in 1907 aged seventy leaving seven sons and two daughters. 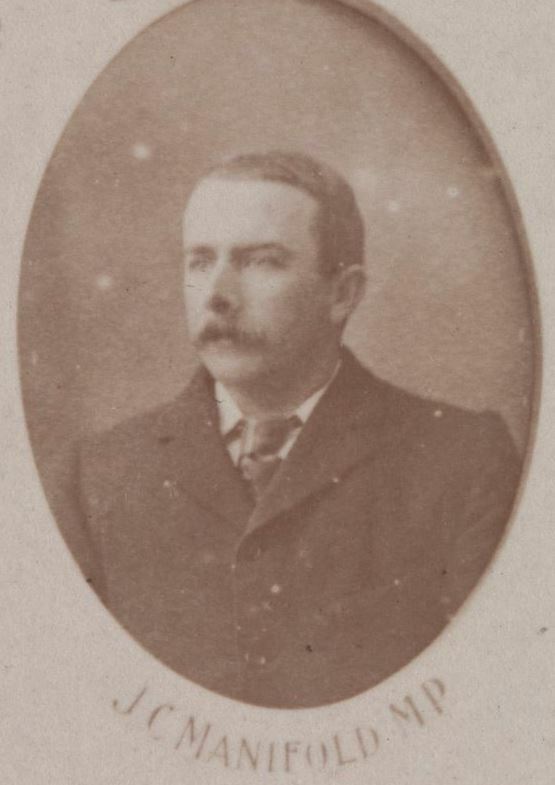 BROWN, William Clarke – Died 28 October 1908 at Coleraine. William Brown was born at Thornbury House, Northampton, England in 1824 and arrived in Victoria in 1844. He met Margaret Sefton who arrived in 1841 from Ireland, in Melbourne and they married at St James Church Melbourne in 1846. They went to Heywood and William worked for Mr Bilston’s property before they settled at Dundas Vale, Bil-Bil-Wyt. William claimed he was the first man to drive a cab in Melbourne and Hamilton. William and Margaret celebrated their sixtieth wedding anniversary on 6 February 1906. Their thirteen children, eighty-one grandchildren and eleven great-grandchildren joined them. James Meek, a photographer from Hamilton took photos at the anniversary celebrations. 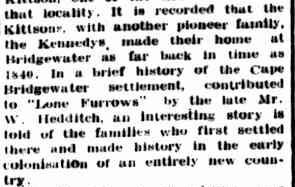 “THE FAMILY OF WILLIAM AND MARGARET BROWN .” Weekly Times (Melbourne, Vic. : 1869 – 1954) 7 April 1906: 12. Web. 13 Oct 2018 <http://nla.gov.au/nla.news-article221220108&gt;. By that time, William was living with his son where he died in 1908. Margaret died in 1915. WALSH, Margaret – Died 1 October 1918 at Grassdale. Margaret Walsh was born in Cork, Ireland in 1817 and arrived in Tasmania in 1841. She met Samuel Evans Young who she married and they left for Portland. They settled at Tahara and Samuel farmed and during the 1870s, he operated the Tahara store. “Advertising” Hamilton Spectator (Vic. : 1870 – 1918) 26 February 1878: 3. Web. 15 Oct 2018 <http://nla.gov.au/nla.news-article226069628&gt;. Margaret and Samuel remained at Tahara until Samuel’s death in July 1907. The Age reported on Samuel’s death at the age of eighty-four and mentioned his wife was 100 years old. “HAMILTON.” The Age (Melbourne, Vic. : 1854 – 1954) 22 July 1907: 6. Web. 13 Oct 2018 <http://nla.gov.au/nla.news-article198611068&gt;. However, Margaret lived for another eleven years but wasn’t 111 when she died, rather 101. She spent those eleven years living with her son at Grassdale. Margaret lived through the reign of six British sovereigns. MANIFOLD, James Chester – Died 30 October 1918 at Sea. James Manifold was born at Purrumbete estate (below) in 1867, the fourth son of John Manifold and Marion Thomson. He was educated at Geelong Grammar School. After the death of their father John in 1877, Purrumbete was divided between the four Manifold brothers. Chester’s share was “Talindert“. In 1890, James was elected to the Hampden Shire Council and would go on to serve as President. 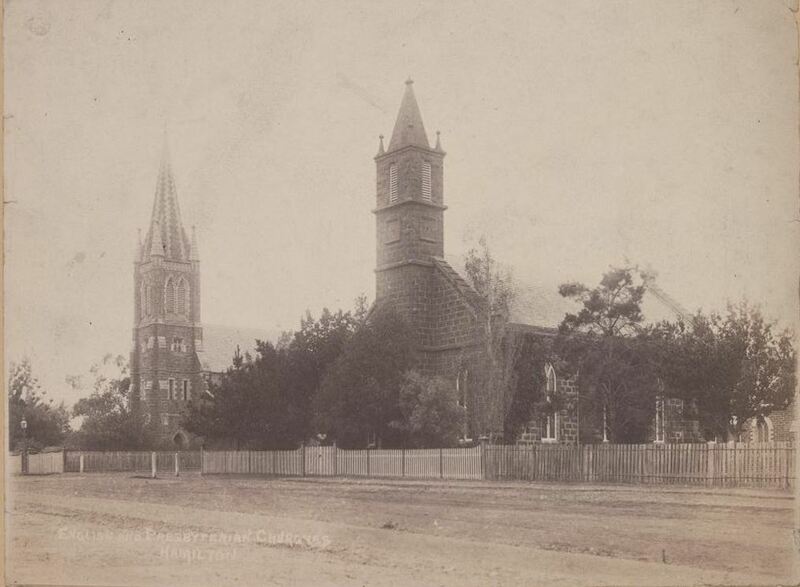 The following year, he married Lillian Eva Curle on 11 March 1891 at St Paul’s Church, Camperdown. James was involved with football and cricket and his in younger years, was one of the best sportsmen in the state. With his brothers William and Edward, he represented Victoria in polo (below). James was also interested in racing as an owner and breeder. 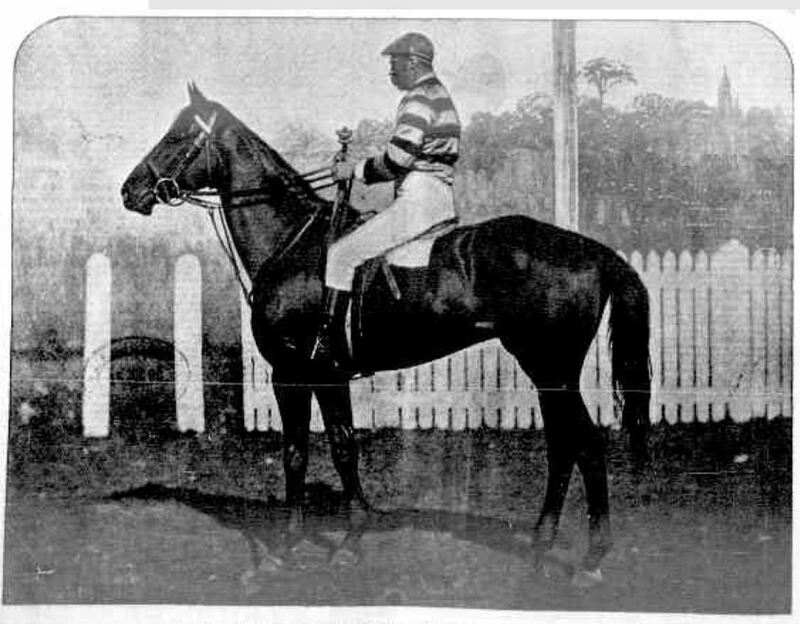 One of his successes, with his brother Edward, was the 1896 Victorian Racing Club Grand National Steeplechase with Dungan (below) considered Australia’s greatest steeplechaser at the time Dungan was killed less than two weeks later in a race fall at Moonee Valley on 25 July 1896. “GRAND NATIONAL STEEPLECHASE WINNER.” The Australasian (Melbourne, Vic. : 1864 – 1946) 18 July 1896: 24. Web. 16 Oct 2018 <http://nla.gov.au/nla.news-article139728388&gt;. With the approach of Federation in 1901, James ran for the seat of Corangamite. He was successful and was a member of the first Commonwealth parliament in 1901 but resigned in 1903. He decided to run again for the Federal seat of Corangamite in 1913 and defeated sitting member James Scullin. During WW1, James gave 3000 acres of land for returned soldiers and donated thousands of pounds for soldiers’ repatriation. His only son, Thomas Chester Manifold served with the Royal Field Artillery with the British Army. James travelled to England in 1917 for government and private business and in 1918 left Sydney for a trip to San Francisco. It was on that voyage he developed pneumonia and died on 30 October. He was buried at sea. James left his widow, Lillian and Thomas Chester. and a daughter. As a result of his death, a by-election was held in the seat of Corangamite and James Scullin returned as the member. Scullin went on to become Prime Minister of Australia from 1929 until 1932. At a local level, James and his brothers were great benefactors to Camperdown. 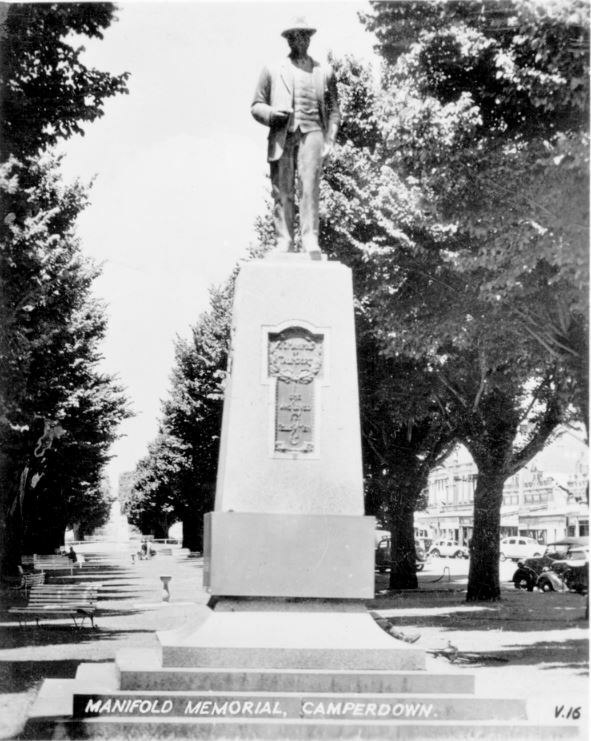 A statue to honour James (below), located in Manifold Street, Camperdown, was unveiled in 1921. MANIFOLD, William Thomas – Died 20 October 1922 at Camperdown. William Manifold was born in 1861 at Purrumbete estate, the eldest son of John Manifold and Marion Thomson. 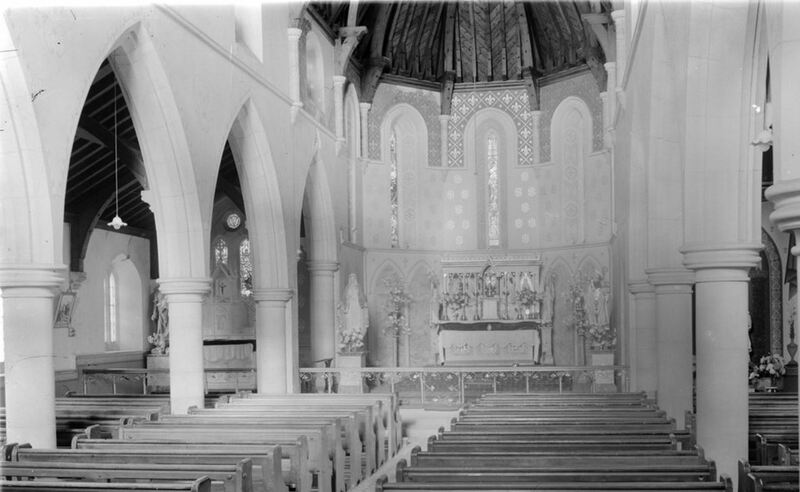 On 6 August 1886, William married Alice Mary Cridland at St Mary’s Church, Papanui in Christchurch, New Zealand. 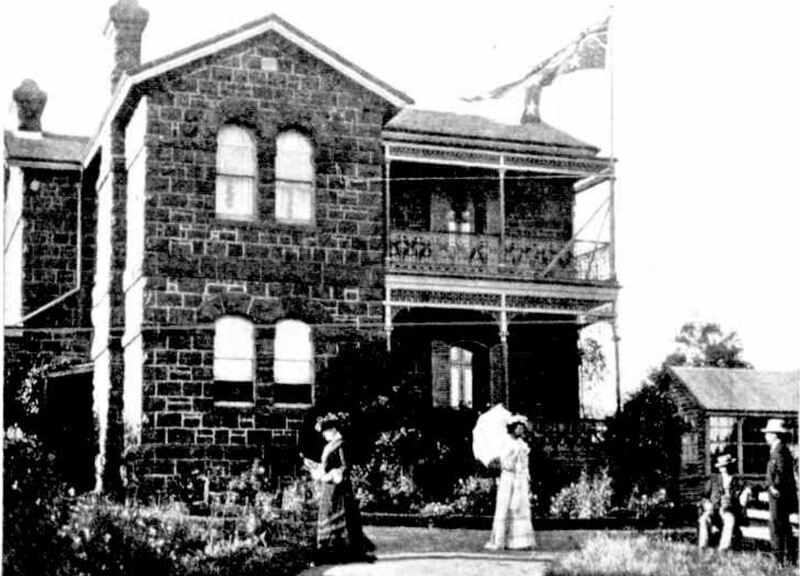 The couple settled at the family station of Gnarpurt, Lismore for a time after their marriage. William and Alice eventually moved back to Purrumbete. (below) The station became known for its dairy herds. William was a champion polo player and teamed up with his brothers James and Edward to compete for Victoria. He was a supporter of the Church of England and Vicar’s warden of St Paul’s Church, Camperdown. He donated money to Geelong and Ballarat Grammar Schools and served as a Hampden Shire councillor. During WW1, William and Alice’s son Lieutenant William Herbert Manifold was killed on 28 April 1917 in France while with the Royal Field Artillery aged twenty-seven. Just over three years to the day after William Jr’s death, Alice died at the age of fifty-four. On 20 October 1922, William MacKinnon of Marida Yallock, visited William at Purrumbete. They were driving nearby when the car became bogged. While trying to free the car, William had a heart attack, collapsed and died. He was sixty and left two sons and two daughters. William and his brothers contributed much to Camperdown and the clock tower they donated to the town in memory of their brother Thomas Peter Manifold who died in 1895 stands today as a reminder of that contribution. It’s a bumper Passing of the Pioneers for December with twenty-five new pioneer obituaries from across the Western District. Christmas is a particularly sad time to lose a loved one and this month there are five pioneers who passed away on Christmas Day. Two of those were at Casterton on Christmas Day 1917. As with most months, there are those with something in common. This month, sons or grandsons at war was a common theme. Remember to click on any underlined words to find further information about a subject. David Wright BRAYSHAY – Died 16 December 1888 at St Kilda. 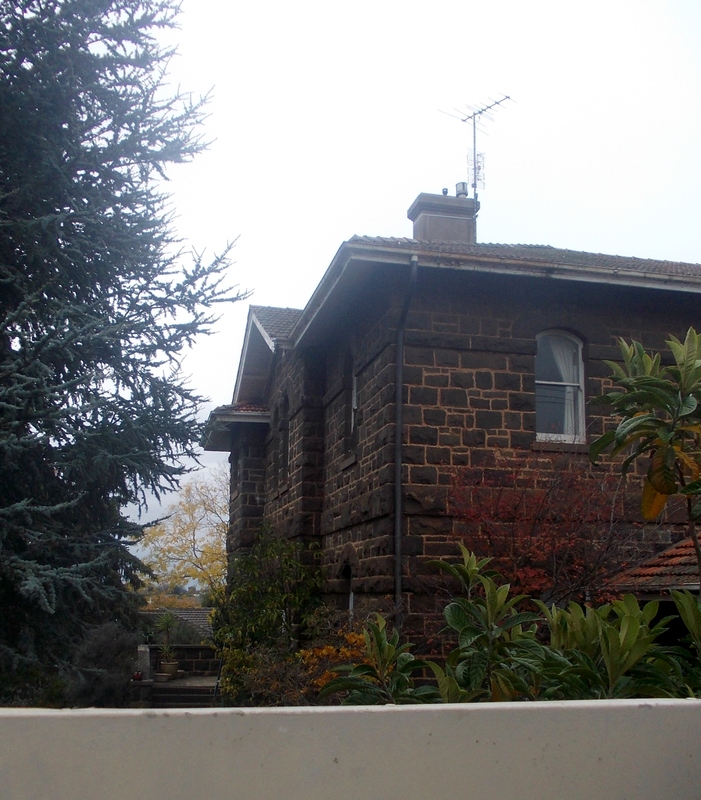 David Brayshay and his wife Maria Scott arrived in Buninyong near Ballarat around the time the Union Jack Lead near Warrenheip Street opened in 1857. He opened a drapery with a Mr O’Donnell almost opposite the Robert Burns Hotel in Warrenheip Street. They then built a brick shop near the centre of the township. When the partnership dissolved, David remained in the brick shop and expanded into groceries. 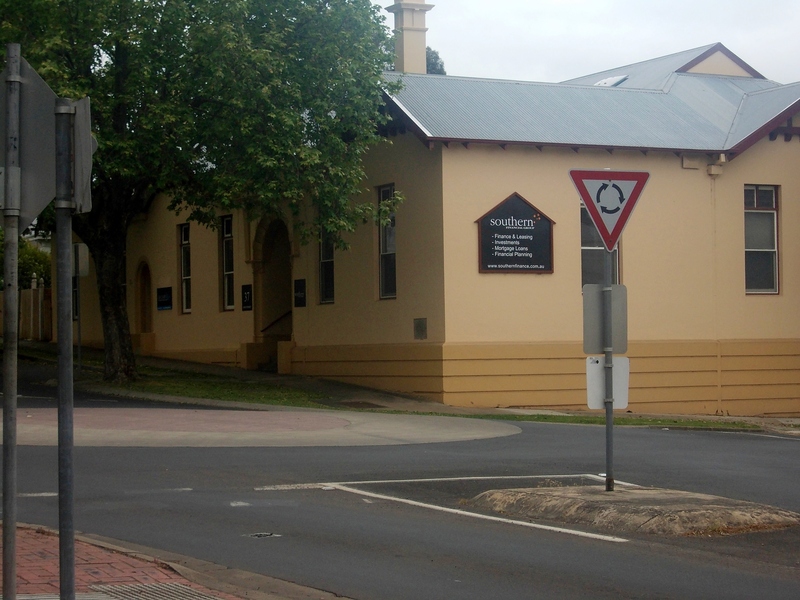 During his time in the town, he was a Buninyong Councillor from 1863 until 1869. Things turned awry in 1869 when the Ballarat Star reported David’s insolvency and an order of compulsory sequestration. His insolvency case continued in the courts into 1870 and it was not long after David and his family arrived in Hamilton. 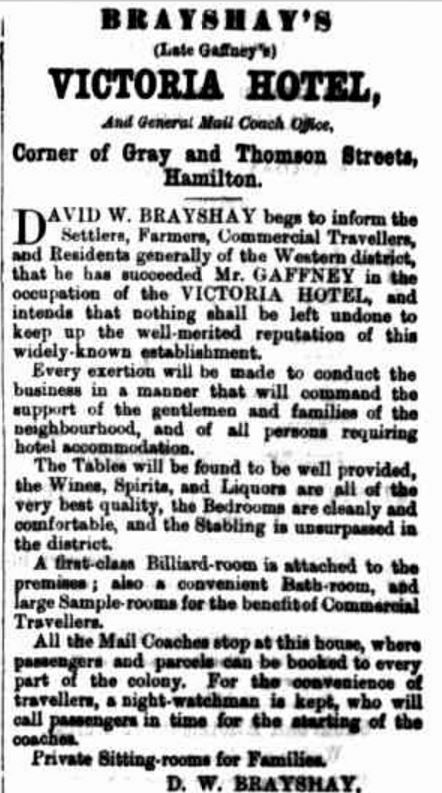 David purchased a large amount of land near Buckley’s Swamp and took over the running of Hamilton’s Victoria Hotel. “Advertising” Hamilton Spectator (Vic. : 1870 – 1918) 9 November 1870: 1. Web. 25 Nov 2016 <http://nla.gov.au/nla.news-article196302997&gt;..
David was again drawn to public life serving as a Hamilton Councillor and Mayor. 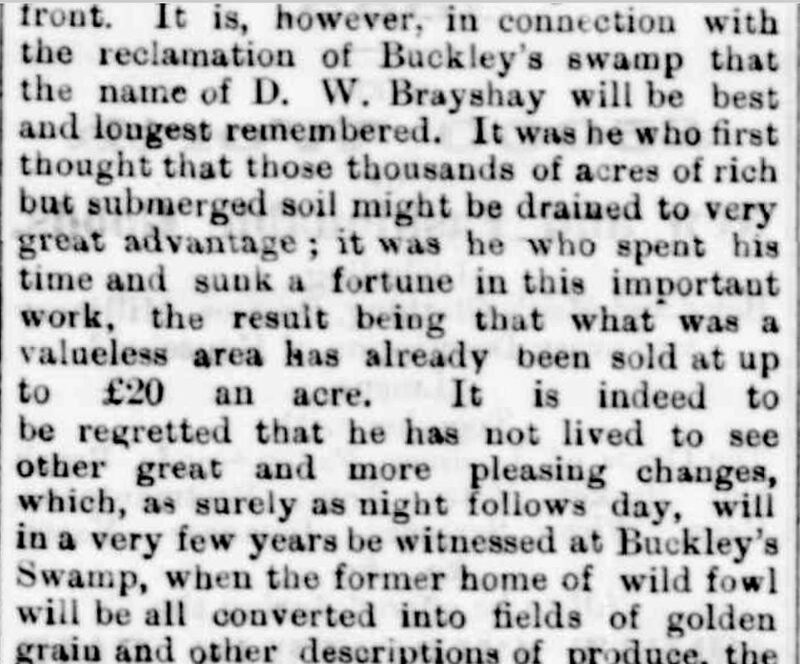 On 14 February 1884, the Hamilton Spectator reported David wanted to let 1000 acres of land, reclaimed from Buckley Swamp, for farming purposes. David’s contribution to reclaiming the swamp was remembered in his obituary in the Hamilton Spectator. “OBITUARY.” Hamilton Spectator (Vic. : 1870 – 1918) 18 December 1888: <http://nla.gov.au/nla.news-article225762827&gt;. 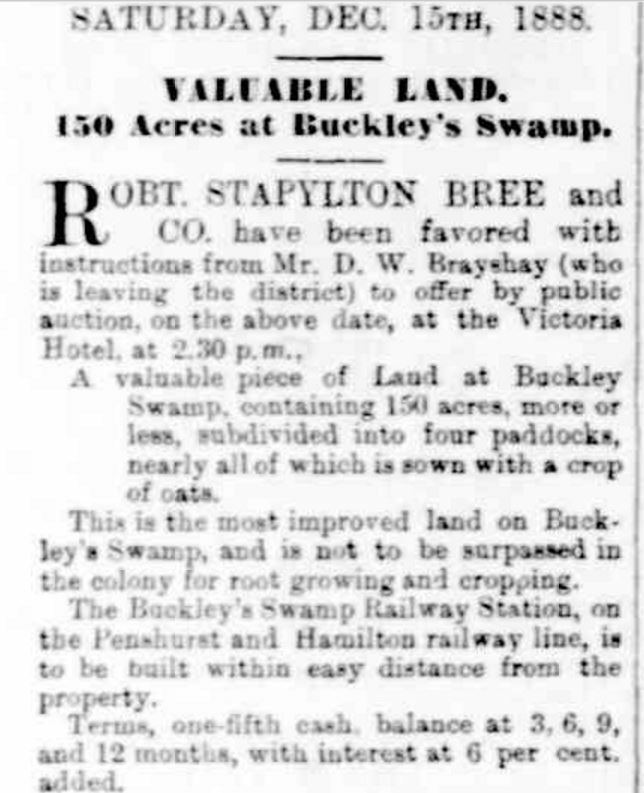 During December 1888, Hamilton agents Robert Stapylton Bree & Co. advertised the sale of David’s land at Buckley’s Swamp because he was leaving the district. The following advertisement appeared in the Hamilton Spectator on 13 December 1888 for the auction on the following Saturday. “Advertising” Hamilton Spectator (Vic. : 1870 – 1918) 13 December 1888: <http://nla.gov.au/nla.news-article225759630&gt;. The sale was then postponed because David, staying at The Esplanade Hotel in St Kilda, fell ill and died the day after the scheduled sale. He left his widow Maria, one son and seven daughters. Maria died at Hamilton in 1902. Ann SAVAGE – Died 4 December 1898 at Hamilton. Ann Savage was born in Walkern, Hertfordshire, England around 1823. She arrived in Victoria during the 1850s and in 1857 at Geelong married Mark William Hughes, widower and father of two sons. The couple arrived at Strathkellar around 1859 and their first child Ellen was born at Hamilton that year. In 1862, a son Frederick Charles Hughes was born. Mark set up a nursery business in Gray Street, Hamilton selling seeds and flowers and the family moved to Gray Street. In 1888, Ann and Mark’s son Frederick married my ggg aunt, Martha Harman, daughter of James Harman, Mark Hughes died in March 1897 and Ann survived for less than two years after. Ann was buried at the Old Hamilton Cemetery. John MacLENNAN – Died December 1908 at Mumbannar. John MacLennan was born at Contin, Ross-Shire, Scotland around 1825 and arrived at Portland aboard the John Davis in 1853. With a good knowledge of sheep, John was employed by Henry Monro at Upper Crawford Station near Hotspur for six years then at Rifle Downs working for Richard Lewis. In 1869, John took up land at Mumbannar where he was always willing to let the passing travelling public stop at his homestead. Elizabeth KINSELLA – Died 6 December 1914 at Hamilton. Elizabeth Kinsella was born in Dublin, Ireland around 1828 and arrived at Geelong with her husband Richard Mullin during the mid-1850s. After living in Geelong for a couple of years, they moved to Portland and then Hamilton around the mid-1860s. They lived in Cox Street and Richard worked as a carpenter. In her later years, Elizabeth was independent and had a great memory of all significant dates from her life. Elizabeth left three daughters at the time of her death. John LUCAS – Died 5 December 1915 at Macarthur. John Lucas was born in Tasmania around 1841 and arrived with his parents in Victoria as a young boy. He lived at Macarthur from the mid-1860s and he worked as a bootmaker. He married Bridget Haley in 1863. Bridget died in 1903 at Macarthur. John’s obituary indicates he had previously been married. At the time of his death, John had five sons, three daughters, forty-four grandchildren and one great-grandchild. Helen LAIDLAW – Died 18 December 1915 at Hamilton. Helen Laidlaw was the second daughter of James Laidlaw and Mary Coates and was born at Learmonth on 24 September 1860. 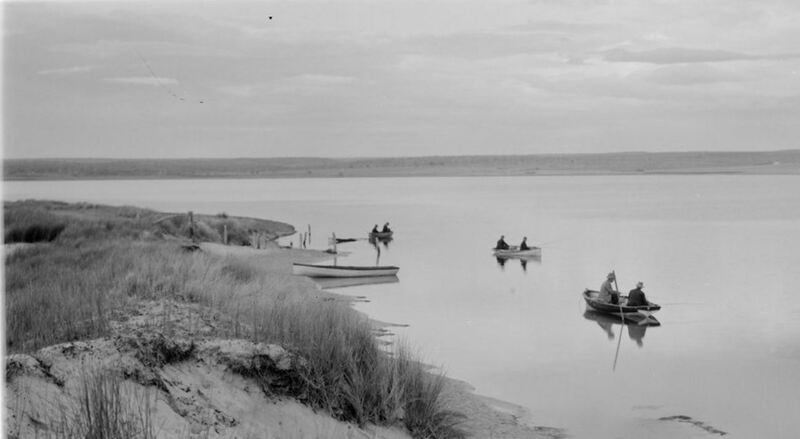 In the 1870s Helen’s father purchased Lake Wallace Station near Edenhope. He was soon back in central Victoria, purchasing Amphitheatre Station south of Avoca around 1880. It was at Amphitheatre Station where Helen married John Fenton of Ararat in 1884. “Family Notices” Hamilton Spectator (Vic. : 1870 – 1918) 31 July 1884: 2. <http://nla.gov.au/nla.news-article226046744&gt;. The following year, Helen and John’s first child Gwendoline was born at Ararat. Soon after they arrived in Hamilton and Nellie was born there in 1887. John ran a stock and station agency in Gray Street, Hamilton and served as Mayor from 1904 to 1906. On 21 June 1915, Helen and John’s eldest son John Wilfred Fenton enlisted, embarking on 18 November 1915. 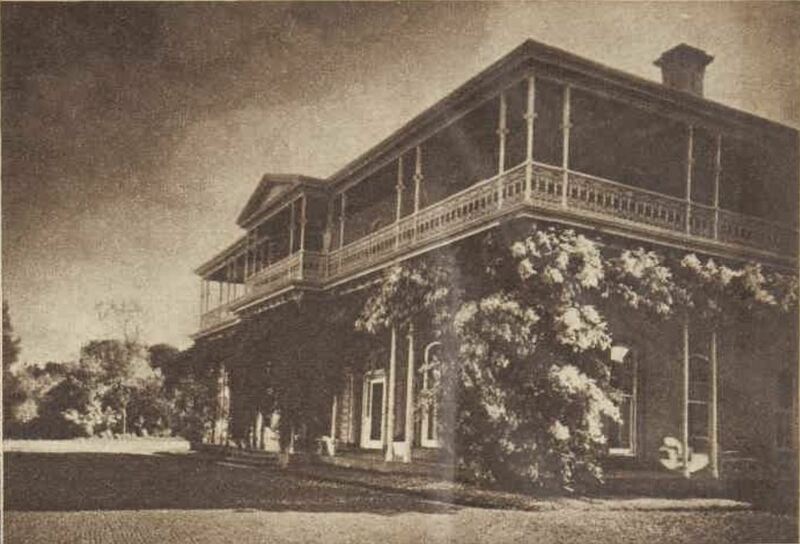 Around two weeks later, Helen fell ill and her condition deteriorated until her death on 18 December at the Fenton home Lantana in Gray Street aged just fifty-five. On 19 June 1918 John Wilfred Fenton, by then a Military Medal recipient, died from the effects of gassing in France. Helen was buried at the Old Hamilton Cemetery and a memorial to John Fenton Jr appears on the headstone. HEADSTONE OF HELEN FENTON, OLD HAMILTON CEMETERY. William BROWN – Died December 1915 at Branxholme. William Brown was born around 1825 in Scotland and arrived in South Australia about 1850. Three years later he married Maria Boyne, arriving in the Western District around 1863. William worked at Muntham and Grassdale stations near Digby then owned by John Coldham. By 1869, they were living at Branxholme where their daughter Agnes was born. William worked as a contractor around the Branxholme district. In February 1909. William lost a daughter and wife. First his daughter Mrs Rosina Joyce of Branxholme then just ten days later his wife Maria died. Two of William and Maria’s grandsons, brothers Matthew and Thomas Joyce were both killed in France while serving in 1917. Isabella IRVINE – Died 15 December 1916 at Mortlake. Isabella Irvine was born at Newcastle on Tyne around 1849 and arrived at Portland with her parents and three siblings in 1854 aboard the Indian Ocean. In 1875, Isabella married Thomas Keogh and they spent their married life living in Mortlake. At the time of her death, Isabella had three sons and one daughter. Two sisters were also still alive, Annie Boswell Irvine Small and Tomina Irvine Small both living in Mortlake and married to brothers Thomas and Charles Small. Henry POTTER – Died 4 December 1916 at Hamilton. Henry Potter was born around 1841 in Norfolk, England and arrived in Adelaide with his parents around 1854. The family moved to Portland and Henry became an apprentice plasterer. After his apprenticeship, Henry entered into a partnership with Thomas Wyatt lasting forty years. Henry married in 1861 to Catherine Stokes. In 1870, Burns and Wyatt moved to Mount Gambier where they remained for five years completing several large jobs including the Mount Gambier Church of England. By 1874, Henry and Thomas had moved their business to Hamilton and worked on the Alexandra Ladies College and the Hamilton and Western District College. In his later years, Henry was a Clerk of Works for the Hamilton Borough Council on projects such as the Hamilton YMCA (below). At the time of his death, Henry was the oldest living member of the Grange Lodge of Freemasons. THE FORMER YMCA BUILDING IN HAMILTON. Thomas McALLEN – Died 16 December 1916 at Port Fairy. Thomas McAllen was born around 1836 in County Clare, Ireland and left when he was twenty-seven with his wife Jane. They arrived at Port Fairy and first lived at Yambuk then Tyrendarra. Thomas retired to Port Fairy around 1910 and lived in Polding Street where Jane died in March 1915. At the time of his death, Thomas had three sons and four daughters. Thomas was buried at the Yambuk Cemetery. Janet Manson CLARKE – Died 17 December 1916 at South Yarra. Janet Clarke was born in Scotland around 1835 and on 23 August 1858, she married John Kennedy MacMillan a young Presbyterian minister. With a demand for Presbyterian clergymen in Victoria, Janet and John left for Australia soon after their marriage and made their way to Beechworth where John was inducted as Reverend of the Beechworth Presbyterian Church. In 1869, Reverend MacMillan was appointed to the St Andrews Presbyterian Church and remained there for thirty-five years. Janet was also active in the community and was a founding member of the Hamilton Ladies Benevolent Society. In 1891, Janet travelled to the “old country” Scotland accompanied by one of her daughters. “Items of News.” Hamilton Spectator (Vic. : 1870 – 1918) 12 November 1891: . <http://nla.gov.au/nla.news-article226165639&gt;. Reverend MacMillan died in February 1904 and Janet survived him a further twelve years. When she died, Janet had three daughters and five sons. She was buried at the Old Hamilton Cemetery. Elizabeth BYRNE – Died 12 December 1917 at Tellangatuk. Elizabeth was born in Liverpool, England and was married there in 1858 to Thomas Jasper. They arrived at Port Fairy around 1864 on the Birkenhead. By then the couple had three young daughters. After spending some time in Port Fairy, they went to Mount Rouse then Dunkeld before settling at Tellangatuk around 1872. The couple had ten children. Thomas died on 7 May 1900. Elizabeth and Thomas had a further nine children after their arrival in Victoria and when she died, Elizabeth had twenty-six grandchildren and four great-grandchildren. Bridget GHEOGHAN – Died 25 December 1917 at Casterton. Bridget Gheoghan was born in England in 1839 and arrived in Australia in 1853 In 1870, Bridget married Robert Pierce at Penola. 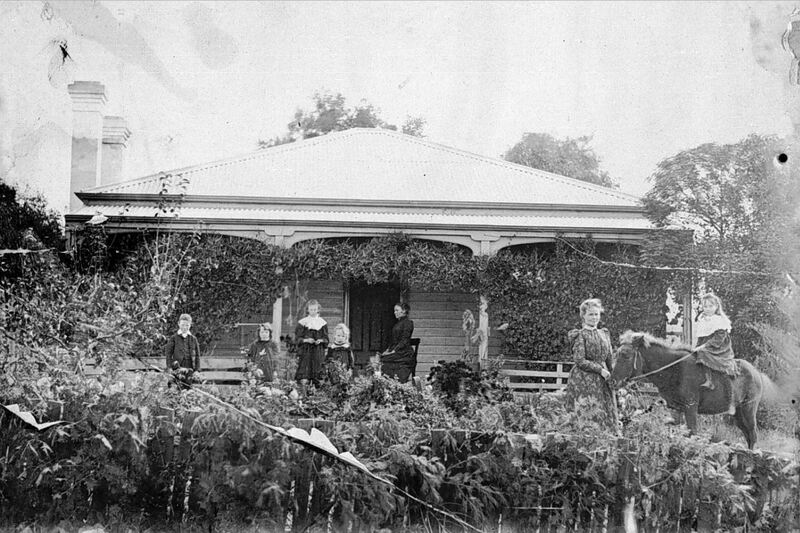 Bridget and Robert lived at Mount Gambier for eighteen years before moving to Casterton around 1880. At the time of her death, Bridget had one daughter and four sons, with her youngest son John serving in France. John died of pneumonia in France on 17 November 1918, seven days after the Armistice. Mary Clare TYNAN – Died 25 December 1917 at Casterton. Mary Tynan was born in Ireland around 1864 and arrived with her husband Richard Bolton in Victoria around 1885. They headed to Casterton where Richard opened a barrister and solicitor practice. Better known as Clare, Mary left one son and two daughters when she died during the evening of Christmas Day. Her son Richard was away on active service at the time of her death and returned to Australia on 1 July 1919. She was just fifty-four. Richard Bolton died in April 1920. William Henry ROSEVEAR – Died 27 December 1917 at Condah. William Rosevear was born around 1848 and in 1869, he married Margaret Morrison. He was a bootmaker at Condah for forty years. William enjoyed cricket and football and was a longtime goal umpire for the Condah football team. He left his widow Margaret and four sons. John GILL – Died 1 December 1918 at Koroit. John Gill was born at Galbally, Ireland about 1844. 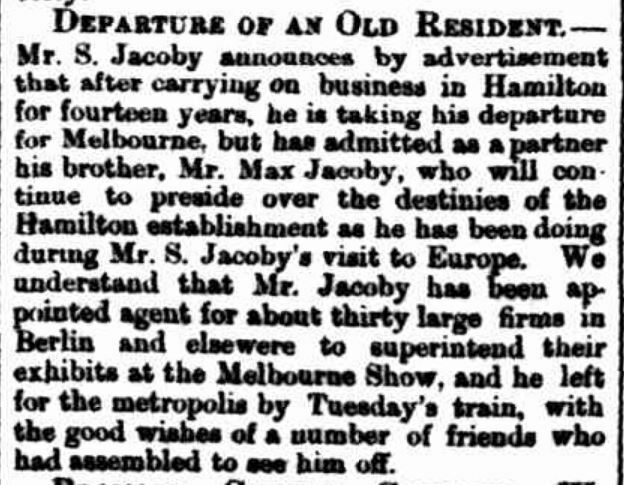 He arrived in Melbourne around 1864 and headed straight to the Koroit district to join family members. He was a carpenter by trade but turned to farming. In 1891, John married Margaret McGrath and they had three children. John was buried at Tower Hill cemetery. Catherine GRANT – Died 7 December 1918 at Digby. Catherine was born in Edinburgh, Scotland in 1839. She arrived in Australia aboard the Lord Raglan in 1862 with her parents and they made their way to the Digby district. Catherine’s was a tragic life. In 1865, she married Thomas Finlay and they had a son Edward in 1867 but tragedy struck in December 1869 when Thomas died as the result of a fall from a hay wagon. “COUNTRY NEWS.” The Argus (Melbourne, Vic. : 1848 – 1957) 28 December 1869: <http://nla.gov.au/nla.news-article5809360&gt;. 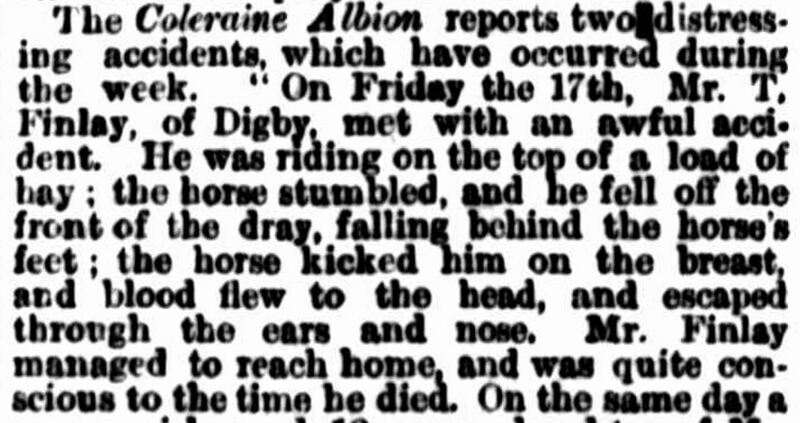 On 8 March 1880, Edward Finlay then fourteen was accidentally shot while he and a friend prepared for a hunting excursion. Edward died a short time after. Catherine lost the two closest to her in the space of eleven years. She never remarried and continued living at Digby for the next thirty-eight years. As she grew older, living alone became more difficult and on 15 December 1913 Catherine slipped while tending to her chickens and dislocated her shoulder. In February 1915, Catherine fell in her backyard and broke her elbow. On 7 December 1918, Catherine died aged seventy-nine and a large cortege followed her remains to the Digby Cemetery two days later. Charles Henry JOHNSTONE – Died December 1930 at Mortlake. Charles Johnstone was born around 1843 and arrived in Victoria as a fourteen-year-old. It wasn’t long before he was drawn to the goldfields and spent time at the Ballarat and Clunes diggings. Still keen to chase his fortune, Charles went to the goldfields of New Zealand but had no success. After his return, Charles selected in the Laang district west of Cobden. In 1871, he married Louisa Molyneaux from Garvoc. Louisa died in 1923. At the time of his death, Charles had sixty-eight grandchildren and forty-five great-grandchildren. John McLean GALLACHER – Died 1 December 1933 at Hamilton. John Gallacher was born around 1867 at Redruth on the Wannon River. As a young man, John went to the Wimmera as land became available but returned to the Western District. He married in 1899 to Emma Payne and they settled at Mount Eccles near Macarthur. In 1917. the family moved to Hamilton and John and Emma were given a send-off at Macarthur’s Methodist church in July 1917. In his younger years, John excelled at football, cricket, boxing and rope quoits. His obituary stated John, “by his sterling manliness. won hosts of friends, by whom he was highly respected.” John and Emma had five daughters and one son and each of the girls became teachers. John was buried at the Old Hamilton Cemetery and forty-five cars followed the hearse to the cemetery. In the early days, Janet welcomed pioneering clergymen into her home and Charles MacGilivray was behind the construction of the first church at Peterborough. Janet was often turned to when a history of the town was sought. She could tell of the times she was lonely when barely anyone else lived around or the tales of the many shipwrecks along the coast near Peterborough. Janet’s six sisters all lived into their eighties and two were living at the time of her death. Thomas O’HALLORAN – Died 24 December 1934 at Hamilton. Thomas was born at Allansford around 1868. His first job was with James Farrar, a Warrnambool coachbuilder. He then went to Macarthur operating a coachbuilding and undertaking business. In 1893, Thomas married local girl Mary Ann Lucas a daughter of John Lucas (listed above). 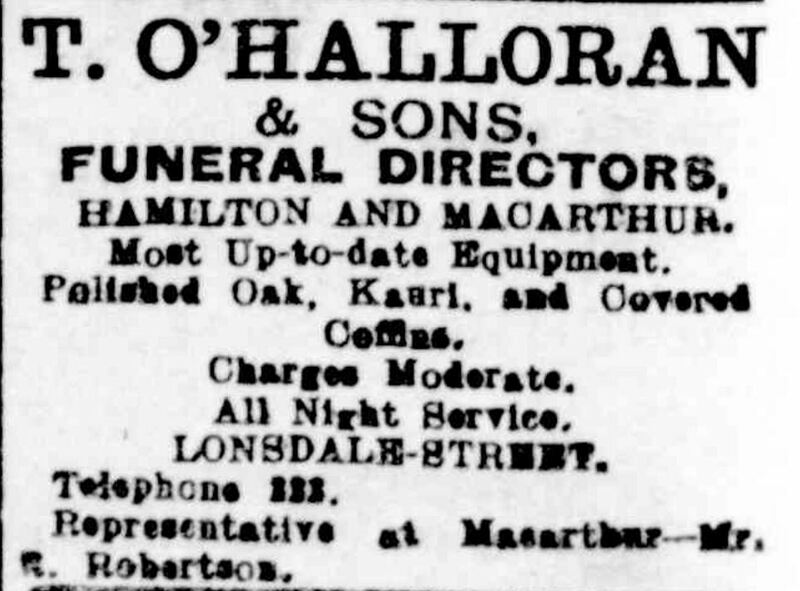 Around 1915, Thomas and Mary Ann moved to Hamilton and Thomas opened Thomas O’Halloran & Son undertakers in Lonsdale Street. “Advertising” Hamilton Spectator (Vic. : 1870 – 1918) 3 March 1917: 8. <http://nla.gov.au/nla.news-article129397006&gt;. Mary Ann died in 1929 and since Thomas’ health was not good, he retired soon after. Thomas was considered one of the best cabinetmakers in the state. His craftsmanship is still on display today in St Mary’s Catholic Church Hamilton, with Thomas having made the tabernacle and canopy over the altar and the confessional. He also made the St. Mary’s Church WW1 Roll of Honour. It was in the same church a Requiem Mass was held for Thomas on Boxing Day after he died on Christmas Eve from a lengthy illness. William Charles PEVITT – Died 25 December 1938 at Heywood. William was born around 1857, a son of Henry and Harriet Pevitt. He married Alice Hannah Scantlebury at Sandford in 1880 and they had four children. Alice died in 1893 at Heywood aged thirty-one. After Alice’s death, William lived with family at Merino and then Homerton. In 1907, William married Mary Ann Brown at Warrnambool. William returned to Heywood and lived there until his death. Mary Ann died around 1935. George Edwin CHARMAN – Died 21 December 1942 at Coleraine. George Charman was born in 1852 at Moorabbin. He married Elizabeth Hollis at Portland in 1877. They spent the first nine years or so of their marriage at Portland before moving to Coleraine where they remained and had eleven children. 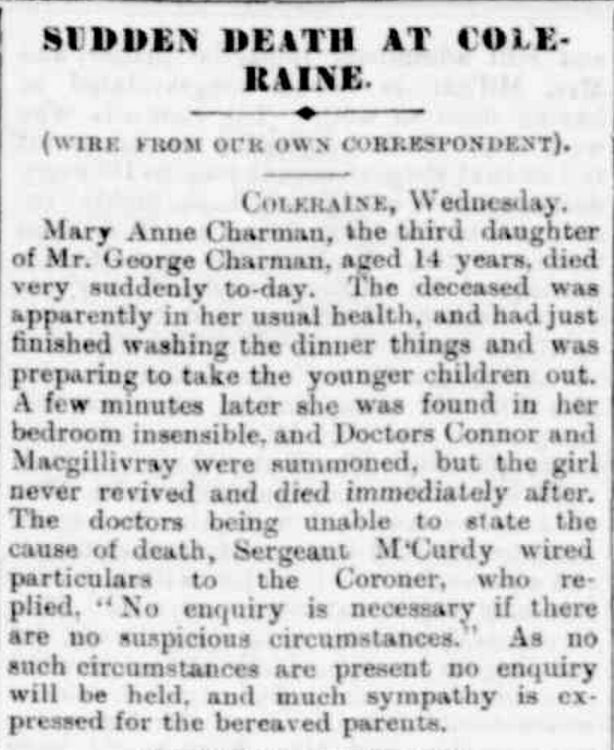 A sad time came in 1897 when their third daughter Mary Ann died suddenly aged fourteen. “OBITUARY” Portland Guardian (Vic. : 1876 – 1953) 4 January 1943: 4 (EVENING). <http://nla.gov.au/nla.news-article64383343&gt;. In 1922, Elizabeth died and in time George moved in with his daughter Edith, wife of Ben Rigby. It was there George died in 1942. He was buried at the Coleraine Cemetery. James WILSON – Died 25 December 1944 at Portland. James Wilson’s parents were earlier settlers at The Lagoons, Bridgewater where he was born in 1863. In 1886, he married Priscilla Hollard. 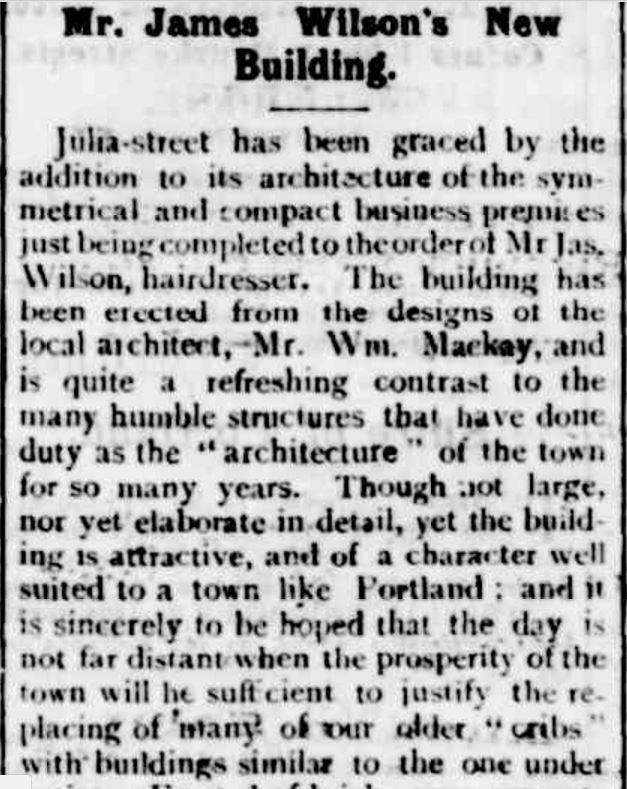 James ran a hairdresser and tobacconist shop in Portland and did some work for Messrs Learmonth & Co auctioneers in Portland. “Mr. James Wilson’s New Building.” Portland Guardian (Vic. : 1876 – 1953) 14 November 1894: <http://nla.gov.au/nla.news-article65397334&gt;. He spent time in Melbourne running a business and living at 346 Burwood Road Hawthorn in 1918 before moving back to Portland in 1937. James was closely associated with the Methodist Church and Sons of Temperance. Priscilla died in January 1943 at Portland. James and Priscilla had no children. William Henry ANDERSON – Died 23 December 1950 at Ballarat. William Anderson was born around 1861 at Linton and married Edith Gardiner of Smythesdale. The couple moved to the Otways, early pioneers of the district. William ran dairy farms at Princetown and Carlise River. They remained in the district until 1914 when William and Edith moved to Wangoom, near Warrnambool but remained in dairy farming. After WW1, William’s returned servicemen sons took up soldier settlement blocks at Chocolyn and William and Edith moved there until 1930. They then moved to Ferguson Street, Camperdown. William was a member of the Oddfellows and enjoyed following football and cricket. He was buried at the Camperdown Cemetery. Edith died in November 1951 at Camperdown. Most of the pioneer obituaries found in the newspapers are for men which is unfortunate because we are always searching for more information about our female ancestors. For the month of October, the obituaries for pioneering women outnumber the men. And great pioneers they were, making great contributions within their communities and all living to a very old age. But none lived longer than Margaret Walker (nee Brown) of Hamilton. Passing away in 1939, Margaret reached the age of 104 and remained healthy almost to the end. Mark NICHOLSON: Died 27 October 1889 at Warrnambool. Mark Nicholson was born in Gloucestershire in 1818 and arrived at Port Phillip in 1840. Rather than practice his profession of law, Mark chose to run cattle at various stations across the colony. In 1848, Governor LaTrobe selected him to act as a Justice of the Peace at Warrnambool and in 1853 he was elected as the Warrnambool and Belfast (Port Fairy) representative in the Victorian Legislative Council. In the following years, Mark spent time in England but returned to Warrnambool to settle in 1873. A full biography of Mark Nicholson is available at the Australian Dictionary of Biography. John BEST: Died 9 October 1907 at Portland. John Best was born in Ireland in 1835 and arrived at Portland in 1857 aboard the General Hewitt. He travelled with his parents William and Letitia Best and his six siblings. The family settled at Heywood and John took up work as a carrier. Later he built bridges and roads for the local Shire. He purchased a farm at nearby Mt. Clay and he remained there until his death. He left a widow and seven children. In him has passed one of the rugged pioneers who came magnificently equipped physically, and with the indomitable energy and capacity for sustained effort responsible for the remarkable development that has marked the brief history of this country. Williams remains were returned from Wallan by train and he was buried at the Camperdown Cemetery. Euphemia McLEOD: Died 3 October 1914 at Purnim. Euphemia McLeod was born in Scotland around 1826 and travelled to Australia on the Edward Johnston around 1854. She eventually settled at Purnim with her husband George Crowe and she lived there for fifty years. Euphemia left three daughters and a son. Ann Rebecca EAGAR: Died 12 October 1917 at Hamilton. Ann Eager was born in Devon, England around 1832 and sailed to Adelaide in the mid-1850s. It was there she married George Rowe and they made their way to Victoria, settling at Wickliffe. They remained there for around thirty years before taking up residence at Hamilton. Only six months before her death, Ann and George had celebrated their diamond wedding anniversary. An article appeared in the Ballarat Star of 14 April 14, 1917 reporting on the couple’s anniversary. It told of George’s work as a builder. He worked on several notable buildings in the district including the Coleraine Catholic Church and the Argyle Arms Hotel in Hamilton. During the war years, Ann supported the cause, knitting socks for soldiers and by the time of her wedding anniversary, she had knitted 120 pairs of socks. Ann and George had three sons and two daughters, twenty-eight grandchildren and seventeen great-grandchildren. Margaret BROWN: Died October 1939 at Hamilton. Margaret Brown was a great Hamilton pioneer living until the grand age of 104. In her last years, her life was documented as she reached milestone birthdays. Margaret was born in Launceston in August 1835 with her parents having come from Scotland in 1830. The family sailed to Victoria around 1840 aboard the City of Sydney and in 1852 Margaret married Thomas Walker at Portland. During the mid-1860s, they settled at Hamilton where they remained. They had eight children, but two died as infants. When Margaret was ninety-eight, she was given a walking stick but she had not used it by the time of her ninety-ninth birthday in 1934. That was also the year of the Portland Centenary and Margaret attended the town’s celebrations. During that year, she had also produced seventeen pieces of eyelet linen work. In 1935, Margaret’s 100th birthday celebration was held at the Hollywood Cafe in Hamilton with the Mayor of Hamilton, Cr. Stewart, in attendance. She also planted a commemorative tree for Victoria’s centenary celebrations. For her 101st birthday, twenty-five friends and family gathered at Margaret’s home at 5 Shakespeare Street. The highlight was a birthday cake with 101 candles. The next three birthdays were celebrated quietly at home. but Margaret continued in good health. That was until only weeks after her 104th birthday when Margaret became more fragile, eventually passing away in October. During her life, Margaret saw the reign of six British monarchs. Elizabeth SILVESTER: Died 7 October 1940 at Noorat. Elizabeth Silvester was born in England around 1852 and arrived in Cobden with her parents as a two-year-old. She ran a business in Cobden for fifty years and attended the Cobden Methodist Church. Married to William Gilham, Elizabeth left two sons at the time of her death, one of whom she lived with at Noorat for the last year of her life. She was buried in the Cobden Cemetery. Catherine McCLURE: Died 29 October 1952 at Camperdown. Catherine McLure was born at Mepunga in 1866, the daughter of James and Eliza McLure, early pioneers of the Warrnambool district. In 1885, Catherine married Benjamin Jeffers at Warrnambool and they moved to Strathbogie. They later returned to the Western District and lived at Timboon, Kellambete and finally, Chocolyn were they resided for forty years. Catherine enjoyed making toys with her five grandchildren and ten great-grandchildren and telling stories of days past. The final “Passing of the Pioneers” for 2011 sees another thirteen Western District pioneers remembered. That takes the number of obituaries recorded into the sixties. The information in each listing is from the newspaper obituary which is a secondary source. If I have found a pioneer interesting, I may include further information, for which there will be a reference available. All “Passing of the Pioneers” posts can be found under “Obituary” in the Category tab in the side bar. “Passing of the Pioneers” will be back in 2012 and with more Western District newspapers available at Trove, there were will be even more obituaries to choose from. I have also updated the post “The Horsham Times goes Digital” to reflect the current additions at Trove. Bridget Priscilla TALBOT: Died December 1904 at Hamilton. Bridget Talbot was born in County Cork, Ireland in 1834 and arrived in Australia in 1848. 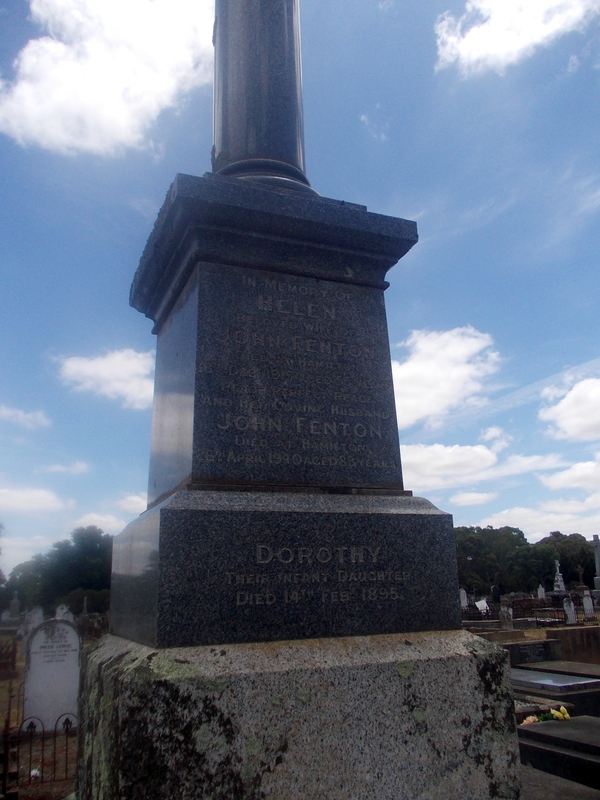 She married John Jennings in Adelaide in 1849 and they moved to Hamilton in 1852 where she resided until her death. Richard PRICE: Died 15 December 1904 at Milltown. Richard Price arrived in Victoria in the late 1850s and settled at Digby. He later went on to Heywood before making his final home at Milltown where he worked in the sawmilling trade. He had eight sons and two daughters. John PERMEWAN: Died 23 December 1904 at Ballarat. Born around 1837, John Permewan gave his name to the well known stores of Victoria, Permewan Wright & Co. He was known around Australia in commercial circles. Permewans still exists in Hamilton. It has seen a couple of name and location changes, but I would often visit there with my parents in the 1970s and 80s for horse feed and saddlery, but it also stocked hardware and still does today. Effie MURDOCH: Died December 1914 at Romsey. Effie Murdoch is the oldest pioneer I have come across to date. She died at age 106. Effie was from the Isle of Skye, Scotland and arrived in Australia in around 1852. Margaret HOARE: Died 16 December 1914 at Nhill. Margaret Hoare and her husband Bernhardt Mulraney arrived in Australia from Ireland during the 1850s. After spending time around Hamilton, Mt. Gambier and Goroke, they settled in the Mallee at Nhill. Margaret was eighty at the time of her death. John HARRIES: Died 18 December 1914 at Stawell. John Harries was born at Llanelly, Carmarthenshire, Wales in 1843 and arrived in Stawell in 1875. Like many with Welshmen, John could sing and was a member of Prout’s band at Ballarat and sang in the Presbyterian church choir. John THORNTON: Died 15 December 1919 at Mount Myrtoon. John was born in Yorkshire in 1835 and travelled to Australia at age eighteen. He spent time in Melbourne and Gippsland before settling at Mount Myrtoon. He set up a successful stock and station business with links to Dalgetys. He was an accomplished cricketer and played for Victoria in his younger days. He was the Melbourne Cricket Club’s oldest member at the time of his death. Mary McLEOD: Died December 1928 at Narracoorte. Mary McLeod was born in the Isle of Skye in 1842. After her mother died when she was eleven, her father moved the family to Australia. Mary took on the role of mother to her younger brothers. After they arrived in Melbourne, they travelled to Portland and then Narracoorte, South Australia by bullock wagon. She later married Angus MORRISON and they eight children while living around the Apsley area. Jenny Sage CRABBIE: Died 17 December 1932 at Branxholme. Jenny Crabbie was born in Edinburgh and having seen the boat the Julia Percy built in Scotland, she was offered passage to Australia by the ship’s directors, whom she knew. It was because of the ship that Jenny met her husband Benjamin Lear in Portland. Benjamin worked on the Julia Percy and continued to do so for some years after. Jenny would have been popular among Portland children. She was a confectioner, with a shop in Bentick Street, Portland for many years. Annie PITTS: Died 12 December 1934 at Portland. Annie Pitts was born in Somerset, England and travelled to Australia with her parents, James and Sarah when she was three. She married John JENNINGS of Portland when she was twenty-one and they had ten children. Annie was eighty-five at the time of her death. Louisa BROWN: Died 26 December 1937 at Camperdown. Louisa was just a baby when her family arrived in Victoria from Westminster, England. She married Henry SHARP, a stonemason, at Terang. They had four daughters and five sons, with the sons forming a quarrying business, Sharp Bros.
Nicholas WHITE: Died 17 December 1942 at Portland. Born in 1869 at Cape Bridgewater, Nicholas was a farmer but a keen sporting interest and was knowledgeable about all matters of cricket and horse racing. His wife had previously passed away and they had one married daughter, Ethel. James Trotter KITTSON: Died 11 December 1945 at Cape Bridgewater. James was a member of the pioneering Kittson family. James left a wife, son and daughter and was buried at the Bridgewater cemetery.